01/31/17 Ford motor company (ford) is recalling certain model year 2016 ford taurus, 2016-2017 ford flex, lincoln mkt, 2017 ford explorer and ford explorer police interceptor utility vehicles equipped with 3.5l gtdi engines. improperly brazed turbocharger oil supply tubes may leak oil on engine components. 10/19/15 Ford motor company (ford) is recalling certain model year 2015 ford taurus, lincoln mks, and 2016 ford explorer vehicles manufactured on july 24, 2015. during vehicle production, the fuel tank attachment bolts may not have been properly tightened. as a result, the fuel tank straps may fracture and the fuel tank could separate from the vehicle. 05/09/13 Ford is recalling certain model year 2012 taurus, lincoln mks, and model year 2013 explorer vehicles manufactured july 19, 2011, through march 15, 2012. in the affected vehicles, the fuel tanks may have a marginally sealed seam in the side of the tank. as a result, the fuel tanks may not provide the expected strength in the event of an impact. the tanks may also leak. 08/30/07 On certain sport utility vehicles equipped with the 4.6l engine and 6r transmission, the bolt securing the transmission oil cooler line fittings at the transmission may not have been sufficiently torqued during vehicle assembly. as a result, the bolt may loosen and the transmission oil cooler lines may disengage from the transmission, causing a transmission fluid leak. Ford recall no. 07s56.customers may also contact the national highway traffic safety administration's vehicle safety hotline at 1-888-327-4236 (tty 1-800-424-9153), or go to http://www.safercar.gov. 09/30/04 On certain sport utility vehicles, the liftgate glass strut may become disengaged or the hinge may fracture allowing the glass to fall and possibly break. If the hinge should fracture, there is a potential for the glass to fall and ultimately break and personal injuries could occur. Dealers will have the liftgate glass strut brackets and glass hinges replaced. for the vehicles built from august 1, 2000 through march 3, 2002, the dealers will replace the hinges and liftgate strut bracket. on vehicles built from march 3, 2002 through june 23, 2003, the dealers will only replace the hinges. the recall began on september 30, 2004. a postcard was sent to owners on december 27, 2004, advising them that parts are now available. owners should contact ford at 1-800-392-3673. Ford recall no. 04s20.customers can also contact the national highway traffic safety administration's auto safety hotline at 1-888-dash-2-dot (1-888-327-4236). 05/18/16 Engine Ford motor company (ford) is recalling certain model year 2015-2016 lincoln mkc vehicles manufactured november 25, 2013, to january 25, 2016, and 2016 ford explorer vehicles manufactured october 20, 2014, to january 28, 2016. the affected vehicles are equipped with 2.3l gtdi engines and engine block heaters. these engine block heaters have elements that may overheat while plugged in. 12/21/15 Engine Ford motor company (ford) is recalling certain model year 2013 explorer, explorer police utility, taurus, taurus police interceptor, flex, lincoln mks, and lincoln mkt vehicles. in the affected vehicles, the fuel delivery module may crack, allowing fuel to leak. 07/20/13 Engine Ford is recalling certain model year 2013 explorer, taurus, flex, fusion, police interceptor sedan and police interceptor utility vehicles; and certain model year 2013 lincoln mks, mkt, and mkz vehicles. in the affected vehicles, the fuel delivery module may develop a crack, allowing fuel to leak. 09/04/15 Brakes and Traction Control Ford motor company (ford) is recalling certain model year 2015 ford taurus, ford flex, and lincoln mks vehicles manufactured may 4, 2015, to may 23, 2015, lincoln mkt vehicles manufactured may 4, 2015, to may 21, 2015, and 2015-2016 ford explorer vehicles manufactured may 4, 2015, to may 23, 2015. the affected vehicles have a parking brake that may not fully engage when applied. as such, these vehicles fail to comply with the requirements of federal motor vehicle safety standard (fmvss) number 135, "light vehicle brake systems." 09/13/17 Suspension and Steering Ford motor company (ford) is recalling certain 2017 explorer, taurus and police interceptor utility and sedan vehicles. the steering gear heat shield fasteners may corrode, allowing the heat shield to detach. 11/18/16 Suspension and Steering Ford motor company (ford) is recalling certain model year 2014-2015 ford explorer vehicles manufactured january 17, 2014 to may 31, 2014. the affected vehicles may have improperly welded rear suspension toe links that may fracture. Ford will notify owners, and dealers will replace the rear suspension toe links, free of charge. the recall began on november 18, 2016. owners may contact ford customer service at 1-866-436-7332. ford's number for this recall is 16s18. 07/23/14 Suspension and Steering Ford motor company (ford) is recalling certain model year 2011-2013 ford explorer vehicles manufactured may 17, 2010, through february 28, 2012. the affected vehicles may experience an intermittent connection in the electric power steering gear, which can cause a loss of the motor position sensor signal resulting in a shut down of the power steering assist. If the vehicle experiences a loss of power steering assist it will require extra steering effort at lower speeds, increasing the risk of a vehicle crash. 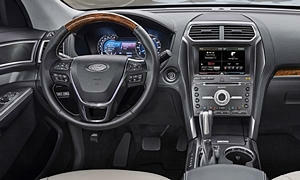 Ford will notify owners, and dealers will update the power steering control module (pscm) software, free of charge. if a vehicle shows a history of a loss of motor position sensor signal when the vehicle is brought in for the recall remedy, its steering rack assembly will be replaced, free of charge. the recall began on july 23, 2014. owners may contact ford customer service at 1-800-392-3673. ford's number for this recall is 14s06. 04/27/07 Suspension and Steering On certain sport utility vehicles, the two bolts that attach the steering gear assembly to the frame may have been over-tightened. this condition could result in one or both of the bolts fracturing, causing the steering gear to become loose. This condition could cause "clunking" noise when steering as well as decreased steering effectiveness potentially resulting in a crash. Dealers will replace both the steering gear assembly mounting bolts and nuts free of charge. the recall began on april 27, 2007. owners may contact ford at 1-800-392-3673. 11/22/05 Electrical and Air Conditioning On certain trucks, passenger cars and sport utility vehicles, the windshield wiper motor may have been produced without grease being applied to the output shaft gear. 07/10/00 Electrical and Air Conditioning Vehicle description: 4-door sport utility vehicles equipped with side air bags. the subject vehicles have a revised level side crash sensor that could deploy the side air bag if the ignition key is in the "run" position and the seatbelt webbing is forcibly extracted from a locked retractor with a jerking motion. Owner notification began july 10, 2000.owners who their vehicles to an authorized dealer on an agreed upon service date and do not receive the free remedy within a reasonable time should contact ford at 1-800-392-3673. also contact the national highway traffic safety administration's auto safety hotline at 1-888-dash-2-dot (1-888-327-4236). 03/16/18 Other Ford motor company (ford) is recalling certain 2016 f-150 and explorer vehicles. loose power seat adjuster pivot bolts may cause the front seat cushions to detach and not properly restrain the seat occupant in the event of a crash. 06/07/17 Other Ford motor company (ford) is recalling certain 2017 ford explorer, f-150, f-250, f-350, f-450 and f-550 vehicles equipped with a manual driver's seat back recliner mechanism. in the event of a crash, the seat back frame may not restrain the occupant due to having inadequate welds. as such, these vehicles may not meet the requirements of federal motor vehicle safety standard (fmvss) numbers 202a, "head restraints" and 207, "seating systems." 08/18/16 Other Ford motor company (ford) is recalling certain model year 2016 ford explorer and f-150 vehicles equipped with a manual recline driver's seat. the seat back frame may have insufficient welds which may not meet the requirements of federal motor vehicle safety standard (fmvss) numbers 202, "head restraints" and 207, "seating systems." 07/23/15 Other Ford motor company (ford) is recalling certain model year 2011-2013 explorer vehicles. in the affected vehicles, the interior door handle return spring may unseat, resulting in interior door handle that does not return to the fully stowed position after actuation. Ford will notify owners, and dealers will inspect all four of the interior door handles and either repair or replace them, free of charge. the recall began on july 23, 2015. owners may contact ford customer service at 1-866-436-7332. ford's number for this recall is 15s11. 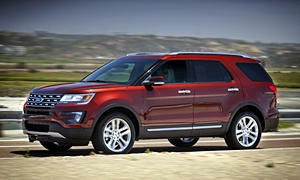 08/02/13 Other Ford motor company (ford) is recalling certain model year 2013 ford explorer, taurus, and lincoln mks vehicles manufactured november 29, 2012, through december 12, 2012. in the affected vehicles, with sufficient door openings and closings, the child safety locks may change from an activated position to a deactivated position without notice. 05/03/10 Other Ford is recalling certain model year 2010 fusion, explorer, explorer sport trac, and mercury milan and mountaineer vehicles manufactured between december 15, 2009 through february 3, 2010 equipped with front seat manual recliners. these vehicles fail to comply with the requirements of federal motor vehicle safety standard no. 202, "head restraint." the recliner gear plate teeth may be out of dimension specification which could result in limited pawl to gear plate tooth engagement. 03/07/03 Other Certain pickup truck, van, and mini van conversions equipped with southern comfort built running boards that contain certain courtesy lights manufactured by american technology components, inc. these units contain a courtesy light or lights that might overheat when the wire harness is exposed to excessive moisture and road salt. 06/07/01 Other Vehicle description: sport utility vehicles. the right side tires may have horizontal cuts on the edge of the tread that could have occurred during vehicle assembly. Over time, the tire could fail, increasing the risk of a crash. Dealers will inspect the tires and, if any slices are found, the cut tires will be replaced. owner notification began june 7, 2001. owners who take their vehicles to an authorized dealer on an agreed upon service date and do not receive the free remedy within a reasonable time should contact ford at 1-800-392-3673. 10/26/00 Other Vehicle description: passenger vehicles, light duty trucks, sport utility vehicles, and mini vans equipped with trw seat belt buckle assemblies. the buckle base of these seat belt assemblies were not properly heat treated and therefore do not pass the load bearing requirement of federal motor vehicle safety standard no. 209, "seat belt assemblies." 10/10/00 Other Vehicle description: certain sport utility vehicles fail to comply with the requirements of part 567.4, "certification." these vehicles were shipped from the assembly plant without safety certification labels. Dealers will replace the certification labels. 12/31/69 Other This is not a safety recall in accordance with the safety act. however, it is deemed a safety improvement campaign by the agency. vehicle description: 2002 ford explorer and mercury montaineer sport utility vehicles. the brackets connecting the left cylinders to each side of the liftgate glass could rotate out of position if either the urethane bond or torque are not sufficient. Rotation of the brackets could potentially cause the lift cylinders to detach from the glass or, in some cases, could potentially cause the liftgate glass to break. either condition is most likely to occur when the glass is being closed. Ford dealers will inspect the vehicles for the position of both the left and right liftgatge glass lift cylinder brackets. if the brackets are in the proper position, the bracket retainers will be tightened to a higher torque. in cases where the bracket is not properly position, the bracket must be re-aligned. Ford has decided to conduct a special service campaign to inspect and torque the liftgate glass bracket on affected vehicles. owners can contact ford at1-800-392-3673, concerning this program.